Warning: Resale of tickets is strictly prohibited. Resale ticket are not accepted in the Park. QR codes on tickets dated Sunday, November 1, 2015 or later that have been purchased from resellers through places such as ticket agency sites or online auctioning sites will be nullified. A studio pass grants you admission to the park and a Universal Express Pass will shorten the waiting time for attractions. The admission ticket includes park entrance and use of all attractions in the park. Prices may differ depending on the date. Please check the travel agency's website for the price calendar. Designating April as the start of the new school year, guests who are to be enrolled in junior high school in April may purchase tickets for children until March 3 but are required to purchace tickets for adults from April 1st. Those guests to whom the above mentioned school enrollment calendar do not apply may purchace tickets according to their actual age: if they are of ages 4 to 11 on the day they wish to enter the park, they may purchase tickets for children, and if 12 or over the tickets for adults. Admission tickets, except for Annual Studio Passes, do not grant re-entry to the park after exiting. Group rates are applicable for a group of 200 people or more. For more information, please contact a major travel agency near you. Admission tickets include Today's Tickets, Advance Tickets. The tickets available for purchase will vary depending on where you purchase them. 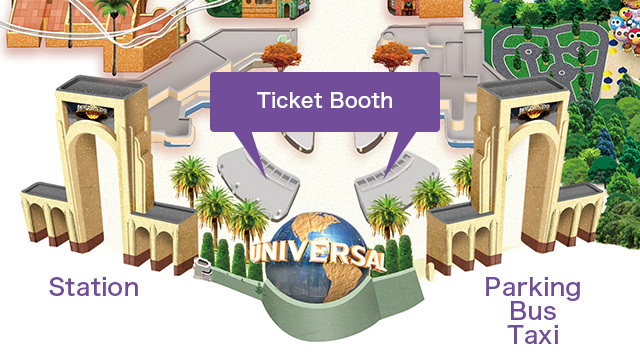 Do not require exchange for a Studio Pass at Ticket Booths and allow direct entry to the park. Make your purchase on the day of your visit at the ticket booth inside the park. *Ticket Booths are open from one hour before the park opens for business until two hours before the park closes. *If you are staying at one of our partner hotels, you may purchase Advance Tickets on the day of your check-in and the following day as well.